Riesling is one of my absolute favourite wines. Wines made from this incredibly aromatic grape can run the full gamut of taste from steely and flinty, passing through dry fruit crispness and ending up at luscious honeyed sweetness. You'll even get an occasional bang of petrol/diesel which is actually incredibly addictive. It's also a fantastic wine to pair with food, particularly spicy or Asian dishes. But how do you navigate Riesling and find the wine that you want, when there is such a choice and variety of styles to choose from? The ever reliable Germans have produced a detailed and structure system for labelling and grading their Rieslings, and while it's a lot to remember, it's worth making a few mental notes for the next time you're facing a wall of Rieslings. Obviously riesling is grown outside of Germany, with special mention for Alsace in France and Clare Valley in Australia, but to be honest, it's the Germans who have really embraced it. To help explain this labelling system, I've borrowed a great graphic from WineFolly.com, a fantastic resource for all things wine. At the bottom the ladder sit Landwein and Deutscher Wein, essentially the equivalent of vin de table. Quality really starts to improve once you move into Qualitatswein, Pradikatswein and VDP classifications. 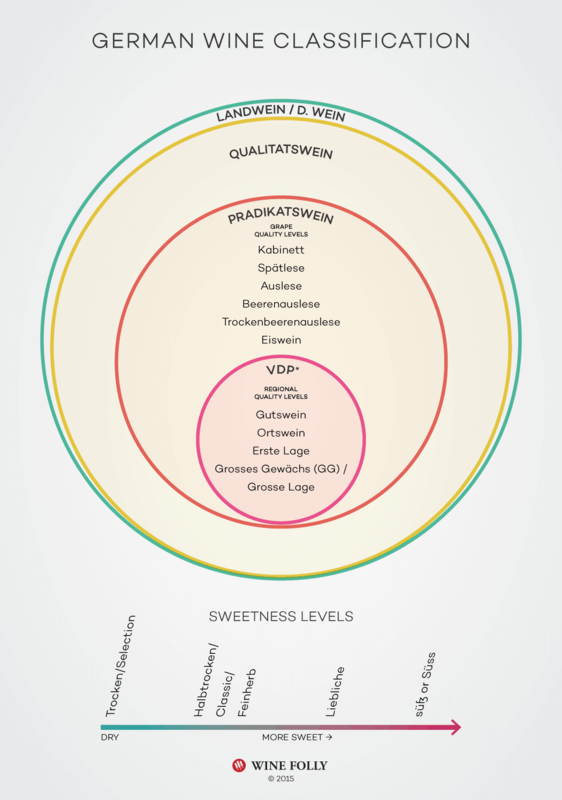 Qualitatswein must be produced with grapes from one of Germany's 13 regions, and there can be additional information on the label to indicate the level of sweetness (remaining sugar in the wine). If you like dry, go for Trocken, whereas sweet will be labelled as Suss. Pradikatswein (or QmP before 2007) wines are common from the Mosel region and this is where some really top notch wines can be found. Again wines run from dry to sweet, with a special classification (eiswein) for ice wines. VDP is used mainly outside the Mosel and includes both dry and sweet and it's here that you'll find Grosses Gewachs, the primo wines from the very best vineyards of Germany. 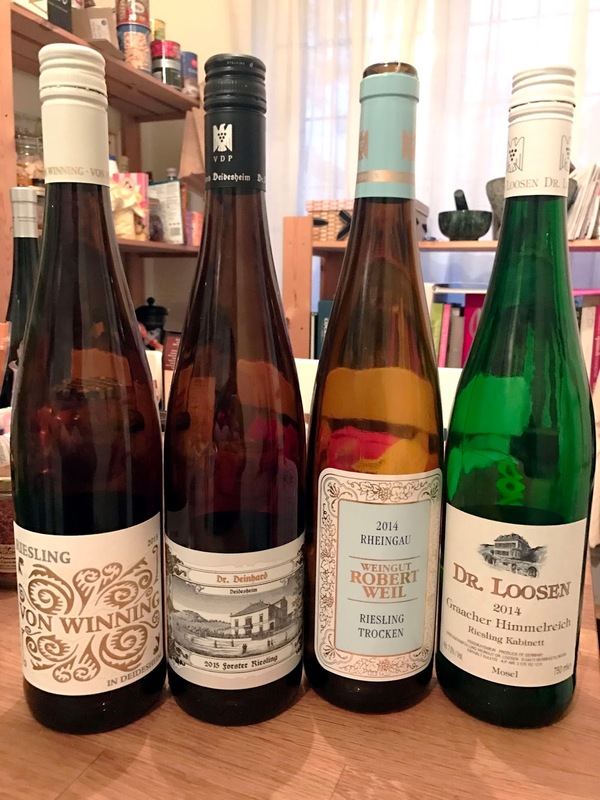 To give you a flavour of what I've been drinking lately, I've gone through my recycling bin (aka "The Box of Shame") to find some of the German rieslings that I've enjoyed. I purchased all wines bar one from The Corkscrew on Chatham Street, or their wine warehouse in KCR. The last wine was purchased in Schiphol Airport. Von Winning is one of my favourite German wineries, and this entry level Pfalz riesling is a great showcase of their ability. It's crisp and fruit-driven with some body added due to a little fermentation in oak barrels. Barrel aging is unusual in Riesling, but it works here. From the same stable as Von Winning (the two families go back over a century), this Pfalz riesling displays more fruit than the first wine, with lots of apricot, peach and pineapple to be found in the glass. Founded in 1875, Weingut Robert Weil is considered to be one of the Rheingau's younger wine estates. Sitting somewhere on the border between dry and sweet, this wine was made from fruit picked at Spatlese levels, bringing a lot of intensity to a mineral driven wine. Weingut Robert Weil makes very classy wines, and this is a great example. Made with grapes from the Graach vineyard with its typical steep slopes, this riesling is quite low in alcohol, registering just 7.5% ABV. It retains the slightest touch of effervescence but it is sweet, with peachy, honey flavours. A lovely wine for light, summer sipping.